3rd Garmin Nuvi 255 | What Car? The menus are responsive and route calculation is quick. The unit keeps up with the action successfully, too, although the brightly-coloured roads can be confusing in built-up areas and the Dalek-like spoken voice is annoying. 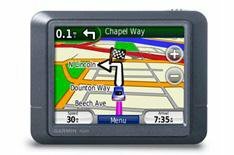 Garmin's software isn't far behind TomTom's for ease-of-use. Big buttons make entering commands simple and the menus are intuitive. We saved 50 by buying at Amazon.co.uk. That makes it cheaper than the TomTom One, and you get European maps as standard, which cost extra on the One. It feels a bit cheap next to the TomTom One and the more expensive Nuvi 765T. There are no sharp edges, though, and the screen is very bright. Garmin's cradle is the best of any we tested it's simple, but sticks to the windscreen well, detaches easily and it's easy to adjust the angle of the screen. The only sub-125 unit that gets European maps as standard. TMC is 20 extra, but the 255 misses out on an MP3 player, Bluetooth, FM transmitter and an economical route-finder.